While we tend to focus on the resulting streams made by water blasters when gauging their usefulness on the water warfare field, this article will look a little more closely at water flow within the water blaster. By looking at how well water flows through the internal system, we gain insight into how or why some water blasters end up performing better or worse than others. We will also look at some arrangements and devices used in various models that affect their performance. This overview should also prove useful for the times when a water blaster is not performing its best as it will highlight areas to look at where problems with water flow may arise and how to correct them (or at least lessen the problem). Before diving in any further, it should be noted that this article and diagrams are based on general observation and interpretation of flow with me having no formal training in fluid dynamics or modeling. We will not (and cannot) dive into formal fluid dynamics to properly model and explain how water flows through these various tubing shapes. Nevertheless, the diagrams and explanations should be enough to offer basic understanding and insight into the causes of turbulence versus laminar flow and the advantages and limitations of various tubing and nozzle arrangements.Much of the article is based on what we have read regarding water flow combined with what we have observed in various settings when looking at flow through clear piping. Some extrapolations are made, but hopefully contained in the realm of reality. That said, if it turns out that some parts are not accurately explained (or if we made a mistake in our explanations), we will correct and improve this article as needed. Consider this a work-in-progress, but hopefully still a good starting point for discussing internal water flows in water blasters. Note: Special thanks to Ben of Super Soaker Central for his input on improving this article's technical accuracy. In an attempt to illustrate how water flows through tubing of various widths and shapes, darker blue arrows are used to illustrate direction and amount of flow. Arrow thickness is related to the volume and force of flow in a particular region of the tube. Thicker arrows mean that the force and volume moving through that part of the tube is greater than where the arrows are thinner. On the other hand, length is used to denote the speed of flow. Thus, longer arrows mean that water in that region of the tubing is flowing more rapidly than areas with shorter arrows. The smallest arrows that are draw curling beyond 180 degrees back are meant to illustrate drag on the higher stream flow and are not meant to suggest that water is actually flowing backwards. Of course, none of the arrows are accurately scaled or angled compared to actual flow through the size of tubing drawn. They are drawn to provide some visuals, but not meant to accurately reflect actual speeds and direction of water flow. One thing rarely appreciated is that water flowing through a tube does not do so all at the same speed. As there is always some level of friction where water makes contact with the tubing wall, this means that the water right by the wall is more inhibited and, thus, will move more slowly (the water in contact with the wall will move at a speed approaching zero) than the water that is able to pass through the center of the tube. While the distance from the middle to wall of the tube does not experience as drastic a speed reduction as the above illustration shows, there is a real boundary layer between the flowing water through the middle of the tube versus the stationary water at the walls. This also suggests that if the surface of the tubing inner walls were less hydrophilic (more hydrophobic), this may reduce the speed discrepancy in the boundary layer. Moreover, if the walls of the tubing are rougher (less smooth), there would be increased drag, a larger boundary layer, and increased turbulence compared to smooth-walled tubing. However, for the purpose of this article, we will focus primarily on the geometry of tubing and water flow, presuming standard, fairly smooth inner walls for the tubing. We will look now at these various tubing possibilities and discuss each one in a little more detail. For tubes with a large cross-sectional area for their inner diameter, most of the water can flow unimpeded. Since this discussion is around standard stock water blasters, we shall define a wide tube as one with an inner diameter wider than 1/8" (~3mm) for a stock water blaster. While this is still a fairly small tube for truly large flow rates, this inner diameter is sufficient to feed a typical 5x nozzle (150mL/sec) without too much difficulty. At these inner diameters, it is estimated that at least 50% of the cross-sectional volume of water should be able to flow unimpeded. However, as one looks at the water flow as one approaches the walls, the speed of flow will drop due to the friction from the water's interaction with the wall. In most cases, the materials standard stock water blasters are made of are relatively hydrophobic (e.g. plastic), thus water tends not to stick too strongly to these surfaces. While wide tubes allow water to flow mostly unimpeded through them, the characteristics of the flow do change as the length of tubing is increased. As tubing gets longer, the amount of drag/resistance due to the water in contact with the walls of the tubing increases. Thus, as flow continues down a longer tube, the flow rate difference between the center flow and side-wall flow increases, eventually resulting in a slowing of the center flow as well. The amount the center flow is slowed depends, of course, on how wide the inner diameter of the tube is as well as how long the water must flow through it before exiting. The only real difference between a wide tube and a narrow tube is the distance from the wall to the center. The challenge with narrow tubing is that since the center flow is not far from the reduced-speed wall contact flow, the center flow ends up being affected in speed sooner than in wide tubing. Moreover, since there is less cross-sectional area in the tube, the volume of water moving at maximum speed is also significantly reduced as compared to wide tubes. Long, narrow tubes are, in essence, the worst of both worlds. Being narrow, maximum volume of flow is already limited and center flow ends up soon affected by the slower wall-contact flow. Being long, this just multiples the reduced center flow effect, thus having a more pronounced effect on the final resulting flow rate versus wider tubes. For example, the Cosmic Liquidator water blaster uses a particularly long and narrow tube from its pressurized reservoir to connect to the blaster portion, then finally out of the nozzle. Stream performance for this water blaster models is far poorer than it could have been were a shorter piece of tubing used instead. As noted earlier, wide tubing allows water through the central part of the tubing to flow with minimal resistance while, not surprisingly, water flow closer to the tubing walls ends up reduced due to friction. As water continues to flow through tubing, this discrepancy between central and outer flow rates presents itself as a loss of laminar flow. While not readily observable while the water is flowing through the system, this increase turbulence leads to both a reduction of end-point flow as well as more stream breaking upon exit. We originally assumed that the turbulence controlling mechanism works by equalizing flow speed through the honeycomb/multiple smaller piping. This explanation is not accurate. Instead, turbulence controlling mechanisms work, also by their geometry, to reduce turbulence by constricting the distance in which the water flow may move perpendicular to the flow (this makes a lot more sense). The honeycomb network of smaller tubing, being solid, reduced perpendicular vibration through the flow, thus significantly reducing turbulence through the stream. There is a balance between how long the turbulence controlling mechanism should be to improve laminar flow while not significantly reducing overall flow speed. Very short turbulence controlling mechanisms (e.g. the screen mesh found inside many nozzles) do improve laminar flow, but only to a limited degree. Perhaps one of the most famous water blaster, the Super Soaker CPS 2000, features a longer turbulence controlling device just after its pull valve, right before its nozzle (and screen mesh). This is one of the reasons the stream from the CPS 2000 flows so smoothly out the nozzle, giving this water blaster such impressive ranges. Above, only linear flows are discussed. However, as is known from looking at water blaster internals, the flow path of water is far from linear. As one would likely assume, inserting an angle into the flow path would result in increased turbulence (loss of laminar flow) in the water flow. In an analogous way to how one can hide from the wind by ducking around and staying close to a corner of a building, turbulence occurs in the water flowing around a corner since the water directly behind the corner does not experience any of the force from the incoming water. As water is forced to make the turn (having no where else to go), the space just around the corner turn ends up back-filled as the water makes the bend. As well, the far corner (opposite to the side of the incoming water flow) also ends up with much more limited water flow despite its position directly in the path of the oncoming water. As water attempts to find the smoothest path around the corner, the flow path strives to smooth out the angles by having some non-moving water serve as a buffer, thus allowing the majority of the water to flow more smoothly past. Of course, non-moving water in contact with flowing water results in some internal eddies to be formed, increasing turbulence again within the resulting flow. Thankfully, most modern stock water blasters do not insert hard angle connections too close to their nozzle. However, a number of pressurized water blaster (usually pressurized reservoir systems) may have some hard angles between the pressurized chamber and the nozzle. While a turbulence controlling mechanism (as discussed above) can be inserted to improve laminar flow, these hard angle connections do reduce the efficiency and maximum power available for generating the eventual water stream. The flow of water through curved, as opposed to angled, tubing is smoother, but more complex than can be easily explained. A simple model would be to suggest that water flowing around the outer edge of the tubing can flow more quickly than that flowing on the inner edge. Since there are no corners, there is no easily identifiable dead space. However, actual flow through curved tubing is far more complex with the optimal (fastest) flowing water migrating to different areas of the tube depending on the shape of the tubing and how far from the start of the curve one is observing the resulting flow. Ultimately, though, curve tubing does introduce turbulence into a water flow, though not as quickly or severely as angled connections do. A number of older style water blasters tended to have longer pieces of curved tubing leading up to their nozzles. The decision to use flexible tubing, even in more recent water blasters, does increase some of the internal turbulence within these systems. However, such decisions are often made in order to fit the other components together into a tight, sturdy package that is more ergonomically friendly for its end-user. Of course, designs that minimize the use of flexible tubing for the path from the pressurized chamber to the nozzle will get better performance from their layout as compared to those that use longer, mneandering tubing layouts between the pressurized chamber and nozzle. The flow through a T-Joint connection varies depending on which side the water is entering from and which side is open for it to exit through. The diagram shows one possibility with water entering from the upper-left side of the T and being allowed to exit out of the right side of the T, presuming the bottom of the T is closed (due to some unillustrated valve). In this case, flow through the T-Joint is similar to that through straight tubing except where the connection exists and there is a water opening where there would otherwise be tubing wall. A liquid wall can be pushed and will end up generating some eddies within the lower part of the T-joint as water flows past, adding some turbulence into the otherwise straight path through. The amount of turbulence added depends, of course, on the size of the opening. For the other possibilities of water entering from either the top-left or top-right and flowing down the bottom of the T-Joint or for water entering from the bottom of the T-Joint and flowing out of either the top-left or top-right, the general flow configuration would be similar to that of Angled Tubing (see above), but with a great amount of water dead space on the far corner. The resulting water flow in this case would have more turbulence as compared to the mostly straight flow across the top of the T.
There are a number of water blasters that have a T-joint between the pressure chamber and the nozzle, but typically use the straight connection to link the two using larger diameter tubing while the lower part of the T-joint that feeds the pressure chamber has a smaller diameter to minimize the amount of turbulence introduced during the water blasting sequence. There are additional angles, more number of possible connections, and other arrangements not discussed above. Not only is this article skipping over any attempts to bring in the proper physics or mathematical modeling, but it also does not look at other tubing arrangements such as thin-to-wide connections, wide-to-thin connections, as well as conical-shaped or other non-fixed width tubing. Nevertheless, hopefully the information presented above offers some more basic understanding of how different tubing arrangements end up affecting water flow within a water blaster. 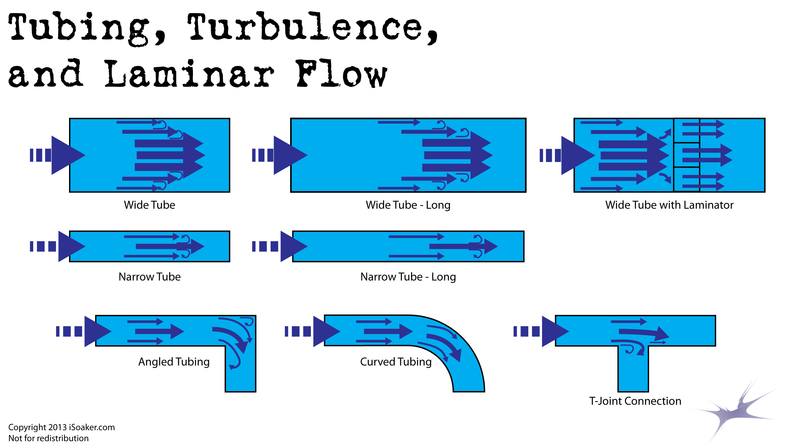 Most of the tubing arrangements that cause the most turbulence are thankfully rarely found in the part of the blaster that lead to the actual stream generation. Of course, turbulence and/or flow restriction at other points in a water blaster's internals can make it more difficult to pump or result in a blaster creating odd noises during the pressurization cycle. In the worst cases, poorly design internal layouts will cause undue stress on key joints that can result in premature failure of tubing seals or connections. Thus, understanding how water flows through water blasters can also help troubleshoot problems when a water blaster no longer functions well. We will look a little more at nozzle theory in another article.